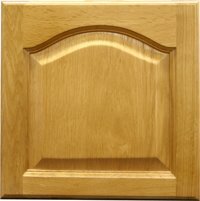 Natural Oak Sample Cabinet Door 13" x 13"
Natural Oak Sample Cabinet Door 13" x 13" Should I purchase a sample door prior to ordering cabinets? YES! YES YES! A sample door should definitely be purchased prior to ordering cabinets. We do our best to accurately represent the finish and quality of the products on the web site but due to lighting, monitor settings and other influences that can effect the appearance of images on a monitor or printed material we always recommend purchasing a sample door before any large purchase is made. An individual cabinet unit can also be purchased so the complete cabinet construction and finish can be viewed prior to making a purchase. If you're concerned about the cost of the sample door, relax. Upon return of any sample door we'll issue you a full refund for the price of the door.